It’s not the end of the world when the G.O. doesn’t work on a Saturday. In fact, it’s very nice. In the construction industry, Saturday work is pretty much a given. But the G.O.’s current work site is located on the South Coast a 80 km each way commute and in exchange for working Monday – Friday 7 am – 5… or 6 pm he’s not been working [many] Saturdays. So on work-free Saturdays we have a glorious sleep in, then over coffee consider possibilities. Last Saturday, motivated by Celia of Fig Jam & Lime Cordial’s post about Little Flowers, who share premises with Velvet Garage café a short stroll from us, encouraged further by the neighbouring Apocalypse Yard’s garage sale we headed over. 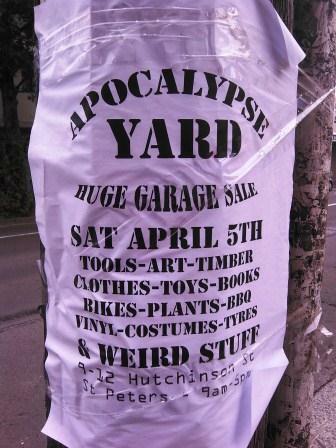 Our foray into the garage sale was brief as they were burning something noxious fuelling their Atomic Cafe barbeque, bestowing an acrid authentic end of the world aura to the proceedings. At Velvet Garage we ordered black coffees right off and I knew I wanted a French Boy but there was much deliberation over menu selection for the G.O.’s part. Eventually after we moved to a brighter table near the door and being able to see the menu he decided on the Ham Sandwich. The coffees were excellent but strong which proved fortuitous as a perfect foil for the flavoursome breakfasts. The French Boy was a stunner topped with creamy yoghurt, unctuous caramel, passionfruit, raspberry coulis, fresh mint and toasted almond slivers but the Ham Sandwich flavoured by maple syrup and dressed up with sliced fresh pear & melted cheese was no slouch either. We shared. The G.O. took command of the Ham Sandwich but forked 2 decent pieces over to me. I made a valiant effort with a slice of The French Boy. The G.O. nibbled at the remaining French Boy, and while I was distracted glancing through the Good Living lift-out of the paper demolished the rest. Necessary then was a long walk home which for which we took the less direct route, noting a couple more St Peters cafés for future reference, It Happens to be a Secret and ASLAN Coffee. Postscript: The French Boy is Velvet Cafe’s quirky and delicious take on French Toast. This entry was posted in Blog and tagged Australia, food, my life, Street Art, Sydney. 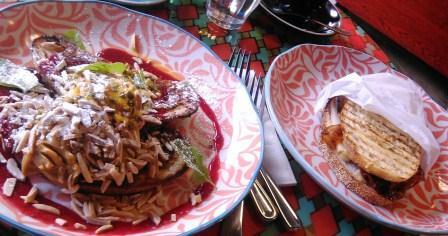 We’ll be going back to Velvet Garage… it’s a bonus to have good cafés this end of Newtown. I’ve never heard of a French Boy until now. The ham sandwich sounded unusual too. It’s great when you find a nice cafe to go to. I’m not surprised the garage sale was a short visit after seeing pictures of what was going. There didn’t seem much except garage stuff. I’m glad you had a great time and a good walk with the G.O. and found future venues too. Velvet Cafe’s menu is a new take on classics. The French Boy their version of french toast/or eggy bread, in Sydney commonly served with bacon/bananas/maple syrup. I’m looking forward to working my way through their selections. I bought a book from the a garage sale – Fast Food Nation – @ $2 at least it was a sensible price. I think it was literally a sale of [somewhat weird & grungy] garage items. Thank you. The Apocalypse Yard really did look like something you’d expect to find at the end of the world rather than the end of the street. I’ve never heard of a French Boy either, although I did have a French boyfriend at one time. Does that count? Isn’t it good to have the weekends off? Partner has been putting his foot down about weekends and so far so good, so, ours. I never had a French boyfriend and I assumed French Toast (Eggy Bread) was common – just shows how parochial I am. It’s lovely having proper weekends but one of the contributing factors to the log jam of things taking up my week day time currently. You’ll be familiar, as I was, with the more mundane version, ie French Toast. The south end of King Street and surrounding areas have embraced cafes, an affection reciprocated by locals, and others, to the point there’s quite a few we haven’t tried as they are just too busy. Another cafe I’m fond of, Petty Cash, a little further away in Marrickville lends out rugs so you can picnic in Enmore Park across the road. I’m really loving the photos of the street art you are taking. That form of expression has come such a long way since the ‘tagging’ and damaging graffiti-only days. It is everywhere, all the countries we visit now seem to have it somewhere… well, except Singapore… That French Boy looks delish, too. Thank you. Local street art was the inspiration behind my elladee_images blog, and balm for my spirit which was a little down when we had to move neighbourhoods… we of course love this end of King Street now. Visually The French Boy (fancy French Toast) was a standout, and delicious but a little went a long way. For us Velvet Garage’s offerings are best shared. The G.O. and I have an affection for skull items – well, he says it’s me… but I didn’t buy anything like that. Other than a quick book purchase, the garage sale air was far too toxic for a good rummage. Much of Sydney’s Inner West is a street art ‘gallery’. Next time you go to Melbourne you may get to visit their city laneways where it’s quite a tourist attraction. Don’t you love it when you eat with someone happy to share a few bites! I enjoyed the slide show, EllaDee. How did you do it? I’m very fortunate that the G.O., my sisters and my best friend Mrs S. have similar tastes to me and are all happy to share plates. When I first started blogging I used the slideshow (via the add media/gallery function – select slideshow rather than mosaic) but changed to the new mosaic format which seems now a little clunky for this theme. Never heard of a French Boy, but it sounds heavenly. The French Boy is bread dipped in egg and fried, leftovers really, but a regular café breakfast item with various toppings although Velvet Garage’s is the most exotic I’ve encountered, and easy to make at home. Glad to see you’re still shooting “city art”, EllaDee. You always find such interesting pieces to spotlight. Glad to read that the G.O. is home on more Saturdays. Granted, it would be better if it weren’t because he was driving 80 km to the job site but at least he’s gets some days off. You’re right. The construction workers I know are never off on Saturday. They miss too many days in our severe Winters to be allowed the luxury of weekends off during the other 3 seasons. I need to get out and find more of that ‘city art’, and while the G.O. has free time, we can wander together, as once this job ends he’ll be working closer but Saturdays… all year round. I can’t imagine how outdoor workers cope with extreme temperatures. Thank you 🙂 We really enjoy getting out and about in Sydney, even just in our own neighbourhood, when we have the time. When you visit your daughter you’ll enjoy Melbourne’s cafes and street art. I’m glad you added the postscript for a French boy, I was a bit confused too and was beginning to wonder what the GO’s thoughts were on it. We called it French bread when I was a child, but eggy bread seems the norm now. Sounds like a delightful Saturday. Yay for the G.O having a Saturday to sleep in and brunch and explore with you!